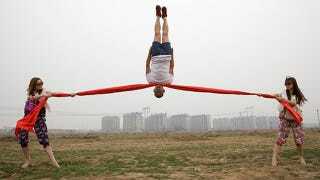 Instead of relying on post-processing tools like Photoshop, photographer Li Wei uses tricks you're more likely to find in a magician's toolkit, including mirrors, wires, and talented acrobatic performers. All combined with the impeccable timing of his camera's shutter. The photos in his 2011 best-of collection are the result of a keen eye and amazing performances, with his subjects appearing immune to the effect of gravity.